NOTE: In April 2013, the HUT data archive was replaced with reprocessed data, and all data set names were changed. All MAST pages describing the HUT data have been updated accordingly. All searches now run on, and retrieve, these new data products. For complete details of the updated pipeline and new data format, see Dixon et al. PASP, 2013. For posterity, we provide a static tarball of the pre-2013 data here. This is the only way to retrieve the pre-2013 data at MAST, and we will no longer be supporting it. To download the calibrated, 1st-order spectra of the white dwarfs G191-B2B and HZ 43 from Kruk et al. 1997, ApJ, 482, 546, where the 2nd-order fluxes have been removed, go here. The Hopkins Ultraviolet Telescope (HUT) was a 0.9 meter telescope with a prime focus far-ultraviolet spectrograph that was used to observe the 912-1850 Å spectral region at a resolution of ~3 Å. A few sources were also observed in the 415-912 Å (2nd-order) region with 1.5 Å resolution. HUT was built by scientists and engineers at the Johns Hopkins University and was one of three ultraviolet telescopes that flew twice on the space shuttle as a dedicated Spacelab astronomy payload. The Astro-1 mission flew on the space shuttle Columbia during 2-10 December 1990, and obtained spectro-photometric observations of 90 targets. The Astro-2 mission flew on the space shuttle Endeavour from 3-17 March 1995, where HUT was used to obtain observations of 275 targets. 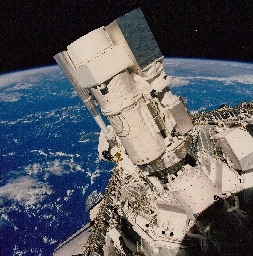 Because of upgrades to HUT between the missions, the instrument was approximately twice as sensitive during the Astro-2 mission.